Experience the best nature in the Icelandic highlands and East Greenland on this epic adventure. We’ve combined treks in Iceland and Greenland so you can discover the unmatched beauty of two spectacular countries in one adventure. You will start with Iceland’s most famous route, the Laugavegur trek, a five day trek from hut-to-hut. Your highly experienced and knowledgeable guide will lead you along the trail from the geothermal valley of Landmannalaugar to the lush green Þórsmörk valley, which sits under the world famous Eyjafjallajökull volcano. The trail features many fascinating natural wonders, including the third largest geothermal zone in the world, yellow rhyolite mountains, black sand deserts, great canyons and the vibrant green valley of Þórsmörk. 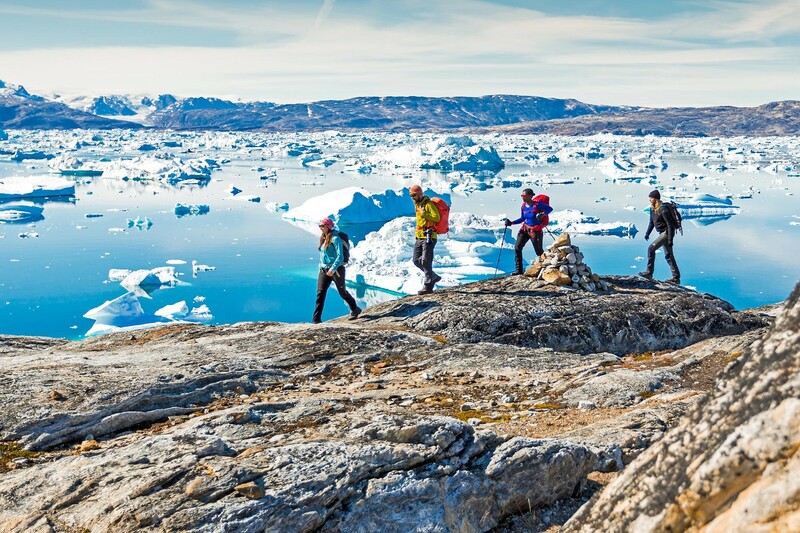 In East Greenland, you will trek in vast and pristine wilderness on our 6-day From Sun Gate to Icefjord adventure. As you hike between campsites, spectacular mountain scenery will be your backdrop. The deep fjords, calving glaciers, blue-green sea, granite mountains, lush vegetation and the extraordinary amount of ice are just some of the fantastic scenery you will encounter. Along with your trek, you will visit a tiny Inuit village, where you witness how the locals live and utilize their natural surroundings to support their way of life. A truly unique adventure in pure nature. Suites those that are physically active and have some background in basic travelling in mountainous terrain with a backpack. 6 - 7 hrs walks per day. Just spent 11 days on the most amazing adventure with Icelandic Mountain Guides. Part one was the Laugavegur Trek, 5 days of hiking from hut to hut with our guide Greta. The scenery was so beautiful and Greta was an amazing guide, cooking and watching out for 15 of us...Part two started with a flight to Kulusuk, Greenland. This is where the adventure part started to get real. As we walked away from the airport towards the small village, we were greeted by howling sled dogs and colorful houses. Here you start to realize you're in a whole different culture...Our guide Thora was awesome. You could really see her passion for Greenland and that she loved every bit of her job. Greenland is very rugged and untouched, and Thora had no problems leading us over all the different types of terrain. The hiking was very challenging and also very rewarding at the end of the long days. You will not see another person for the entire time you are hiking and camping...This company is top notch and based on all my experiences, I wouldn't hesitate to recommend them for adventure travel while in Iceland or Greenland. Transfers between your guesthouse and Reykjavík Airport on day 6. The Great Mystery: what’s the difference between hiking, trekking & backpacking?